July 1938. Another view of "housing conditions in Ambridge, Pennsylvania, home of the American Bridge Company." View full size. Photo by Arthur Rothstein. While I guess the point here is the decrepit nature of the neighborhood, it looks to have been a great place to grow up. Like something from a Neil Simon play. Submitted by doug5861 on Wed, 06/12/2013 - 6:13am. Submitted by Anonymous Tipster on Sun, 11/14/2010 - 9:55am. The homes on the right is the back and on the left is the front side. There were three rows of homes like these, the front ones facing First Street and all three stretching form Maplewood to Merchant street. The other side of First street was lined with businesses on the first floor, and homes upstairs. Submitted by Tony Osegueda on Sat, 04/10/2010 - 1:45pm. I was 2 when my family moved to 201 Marshall Alley. 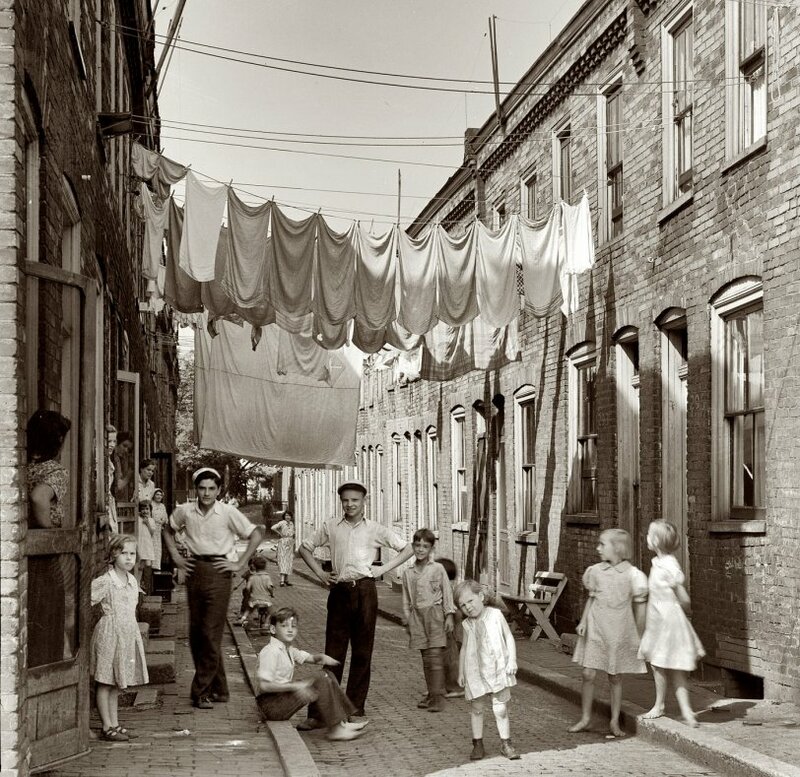 My Grandparents and my uncle and his family lived in "The Alley" for 7 years. Yes, everyone hung their laundry from the second story window, both in front and back. We had to carry the washed laundry from the cellar to the second floor bedroom. Marshall Alley was condemned in the mid fifties but many of us stayed to the last before finding other places to live. We did not qualify for the "new" Economy Village that had been built for lower income families. My family scraped together enough money to put a down payment on a house up on Glenwwod Drive. Lots of great memories from The Alley. Submitted by Frank LeMoyne on Tue, 04/06/2010 - 8:15pm. I've spent a lot of time in my adult life mucking about in Ambridge, and the poor old place is just another dying Rust Belt town now, and just breaks your heart to walk about and see the vacant buildings that line the streets. It's nice to see Ambridge folks in happier times. Submitted by Anonymous Tipster on Wed, 07/02/2008 - 11:28am. My mother grew up in this neighborhood she affectionately calls First Street, on Marshall Alley ... She said it was the best place ever growing up, even though everyone was pretty poor. They have a First Street Reunion every year to this day and have a dinner gathering. She always talks about her friends during that time and how everyone looked out for everyone else. Submitted by Brent on Sun, 01/13/2008 - 1:01pm. While 1938 is late enough for cars, there's no indication of when the buildings were built. Dare I say it, since this was obviously a working class area and probably developed at the same time as American Bridge set up operations - probably as company housing - there may have been a feeling when it was being built that there was no need for wider streets; that the people living in the area wouldn't have carriages or horses (let alone those new-fangled horseless carriages) so why waste the space when you could build more row housing. I would imagine that if this are were ever redeveloped the old buildings would be torn down and new streets would be laid out to modern standards. Submitted by Dave on Sun, 01/13/2008 - 12:38pm. Submitted by Andrea 'Enthal on Sun, 01/13/2008 - 12:25pm. I also think this is a back alley and you are seeing back doors on these row houses. Reason 2: Who hangs their laundry out in FRONT of their home? Reason 3: This is late enough for motor vehicles, yet only a horse, bicycle, or person could walk down that street. Seems evidence that the street is on the other sides of the buildings and this is just meant as an walkway. Submitted by Jeff on Thu, 01/10/2008 - 1:48pm. My dad grew up in Ambridge; my grandparents lived there until they died a few years ago. I've spent lots of time tehre. But I can't for the life of me figure out where in Ambridge this photo was taken. Most of the town looks nothing like this, but is single-family homes of various sizes (nearly all modest), including the early 18th Century Harmonist community. Next time I'm back there I'll roam around and look for this alley for sure. I wouldn't be surprised if it were still there--urban renewal pretty much left Ambridge unscathed. Submitted by Lance on Thu, 01/10/2008 - 9:09am. This reminds me of scenes from many of those old musicals, where someone is walking down the street and begins to sing, and all the people looking out the windows chime in with harmony and choruses...and everyone dances in step. Submitted by Mike_G on Thu, 01/10/2008 - 7:52am. The American Bridge Company (a division of United States Steel) built a number of LST ships for the US Navy during WW II, including the LST- 847. The above photo shows the constructor's plaque that was mounted on the wall of the officer's dining area in the LST-847. 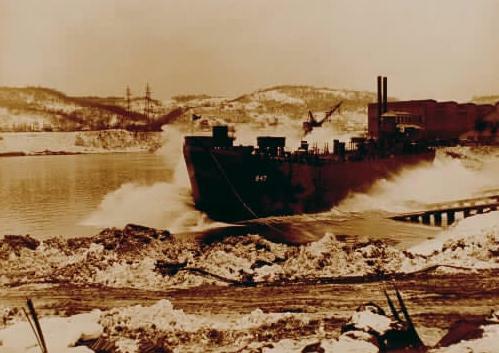 The LST-847 slides down the launching ways and into the Ohio River at the American Bridge Co., Ambridge, PA on Dec. 17, 1944. Submitted by Anonymous Tipster on Thu, 01/10/2008 - 12:23am. I grew up in the Pittsburgh area. It never dawned on me that the town of Ambridge took its name from the American Bridge Company that was located there. Great old photo. Submitted by Anonymous Tipster on Wed, 01/09/2008 - 9:20pm. The appeal of this place is the closeness. The neighbors all know each other and rub elbows every day. My childhood neighborhood wasn't quite as crowded as this but we all knew each other well, while we don't today. I miss it. Submitted by Ron on Wed, 01/09/2008 - 8:30pm. With the exception of the front steps, my house had 4 steps, this looks just like the street I grew up on. the actual street was wide enough for cars to park on one side of the street, the second floor had two bedrooms and a bath, the first floor had a living room, dining room and a kitchen, the basement ran the length of the house, it was a great place to grow up. Submitted by Dewey on Wed, 01/09/2008 - 7:43pm. Are we looking at the backs of these apartments? Submitted by Anonymous Tipster on Wed, 01/09/2008 - 6:58pm. I wonder if the girls on the right are twins--they look to be. Everyone looks clean and tidy, very little trash about. I agree--a nice neighborhood.